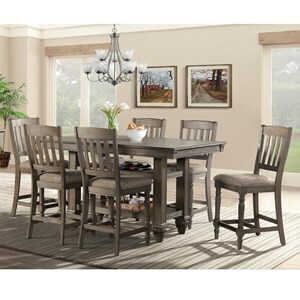 This handsome seven piece dining room set elegantly combines traditional design elements with modern finishes. The set features turned square legs on the table and front legs of the chairs, ladder backrests on the chairs, and cove molding edge on the table. The chairs are upholstered in a neutral color that contrasts with smooth grey finish. The table has one leaf extending the table from 60 to 78 inches. 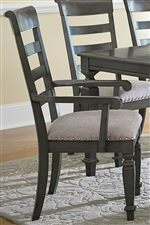 Pair with a buffet and hutch from this collection for an updated take on a traditional dining set. 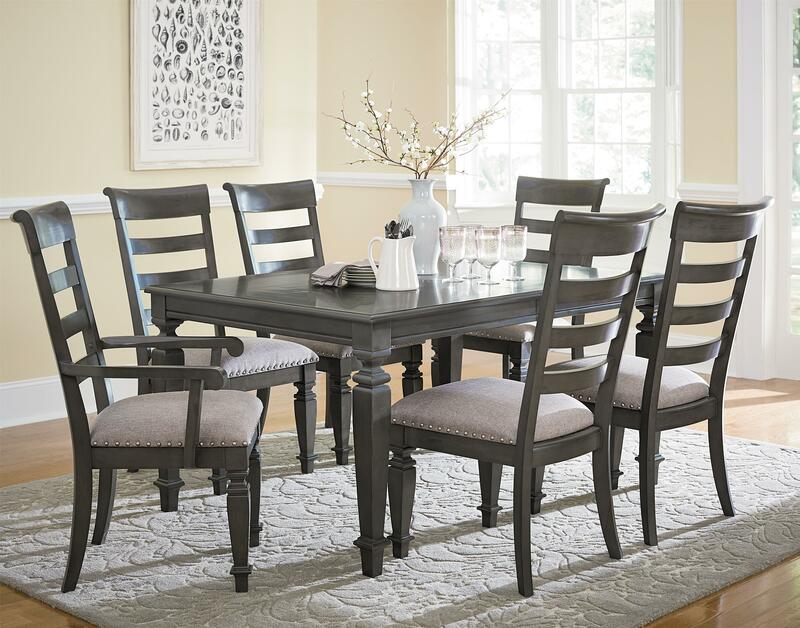 The Garrison Traditional Seven Piece Dining Set by VFM Signature at Virginia Furniture Market in the Rocky Mount, Roanoke, Lynchburg, Christiansburg, Blacksburg, Virginia area. Product availability may vary. Contact us for the most current availability on this product. Case Detail Square Turned Legs, Dentil, Ogee, and Deep Cove Moldings, Beveled Pilaster and Post Overlays, Raised Bed Drawer Frames. 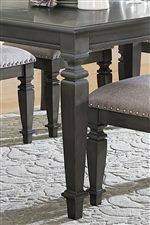 This collection, containing bedroom and dining room furniture, updates traditional design, integrating a contemporary smooth grey finish into classic elements such as turned legs, dentil and ogee molding, and beveled post overlays. For your dining room, choose from two tables, one with elegant legs and the other with an impressive trestle. The chairs are upholstered in a neutral color that pairs with the grey finish. For your bedroom, choose between a upholstered or a panel headboard. Resourceful storage pieces are available for both rooms as well, providing plenty of stylish and convenient options for storing clothes or dishes. 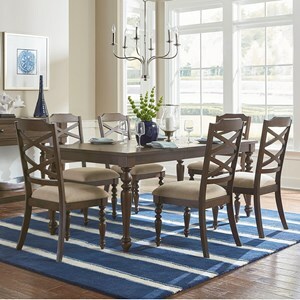 Update your home with this traditional, yet modern collection of dining and bedroom furniture. The Garrison collection is a great option if you are looking for Transitional furniture in the Rocky Mount, Roanoke, Lynchburg, Christiansburg, Blacksburg, Virginia area. Browse other items in the Garrison collection from Virginia Furniture Market in the Rocky Mount, Roanoke, Lynchburg, Christiansburg, Blacksburg, Virginia area.